UNION CITY, Ind. — A Union City, Indiana, man is facing multiple felony charges following a Wednesday drug bust. On July 25, Chief Mark Ater, UCOPD, received information of a possible drug deal that was going to take place at 317 N. Union St. in Union City, Indiana. Chief Ater contacted officers with the Union City, Indiana Police Department and officers set up surveillance around the residence. At approximately 3:49 p.m., officers observed the person who was reportedly going to purchase drugs getting in to a utility trailer on the property. Officers responded to the residence and made contact with Niles W. Helmick, 40, of 317 N. Union St., and John T. Dryden, 37, of Lynn, Indiana. Throughout the investigation it was determined that Dryden was at the residence attempting to purchase fentanyl. Dryden and Helmick were detained while Sergeant Logan Shoemaker applied for a search warrant. A search warrant was granted for the trailer in which Dryden and Helmick were found. 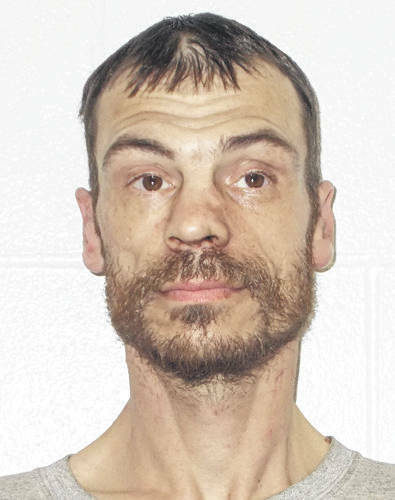 A search of the trailer revealed more than 70 grams of suspected methamphetamine carrying a street valve of $7,000 and 15 grams of suspected fentanyl carrying a street valve of $1,200. Officers also found a bag of suspected marijuana, multiple syringes, and a loaded Mossberg shotgun. Helmick was placed under arrest and transported to the Randolph County Jail where he was lodged on the charges of attempted dealing in cocaine or narcotic drug (Level 5 Felony), possession of methamphetamine (Level 3 Felony), possession of cocaine or narcotic drug (Level 4 Felony), possession of a legend injection device (Level 6 Felony), maintaining a common nuisance (Level 6 Felony), and possession of marijuana (Class B Misdemeanor). It was discovered later that Helmick is classified as a serious violent felon prohibiting him from possessing firearms. The charge of unlawful possession of a firearm by a serious violent felon (Level 4 Felony) was forwarded to the prosecutor’s office as well. “We work hard to stop drug activity in Union City and the proactive approach by officers today only proves that,” said UCIPD Chief Cobie Wells. The Union City Police Department was assisted by the Union City, Ohio Police Department along with the Darke County Sheriff’s Office throughout this investigation. Those who suspect or witness illegal drug activity in the area are asked to call the UCIPD anonymous tipline at 765-287-5393 or the UCOPD anonymous tipline at 937-459-1210. All calls are confidential.